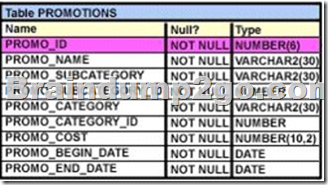 To avoid an "ORA-00932: inconsistent data types" error, all not null parameters must have data types compatible with the first not null parameter. promo_cost * 0.25, 100) "Discount"
Although its name sounds mysterious, this function is straightforward. The DECODE function implements ifthen-else conditional logic by testing its first two terms for equality and returns the third if they are equal and optionally returns another term if they are not. The DECODE function takes at least three mandatory parameters, but can take many more. The syntax of the function is DECODE(expr1,comp1, iftrue1, [comp2,iftrue2...[ compN,iftrueN]], [iffalse]). 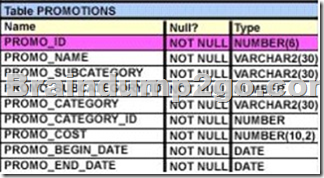 SUM(CASE TO_CHAR(promo_begin_date,'yyyy') WHEN '00' THEN 1 ELSE 0 END) "2000"
COUNT(CASE TO_CHAR(promo_begin_date,'yyyy') WHEN '00' THEN 1 ELSE 0 END) "2000"